Get your whole family to eat healthy and nutrient rich food that looks as good as it tastes. 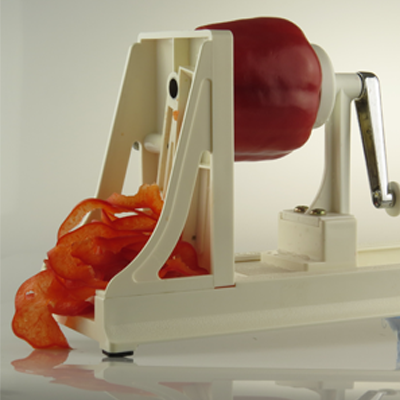 Save time with slicing, dicing and shredding vegetables for salads, garnishes to cook or for tasty stir-fry’s. The Spyra-Gyra does all this in seconds. Use your Spyra-Gyra to prepare nutrient and vitamin rich vegetable noodles that have even the pickiest eater coming back for seconds. Excellent gift for family and friends. Available in White. Comes with 3 spaghetti blades including the angel hair blade. Blade sizes 0.9 mm 2.4 mm and 4 mm. Eco friendly – does not use any electricity as it is hand operated. Biodegradable packaging. Using the flat blade make curly strands with cucumbers, beetroots, apples, baby marrows and much more. These are great to use as garnish, in salads and in side dishes. 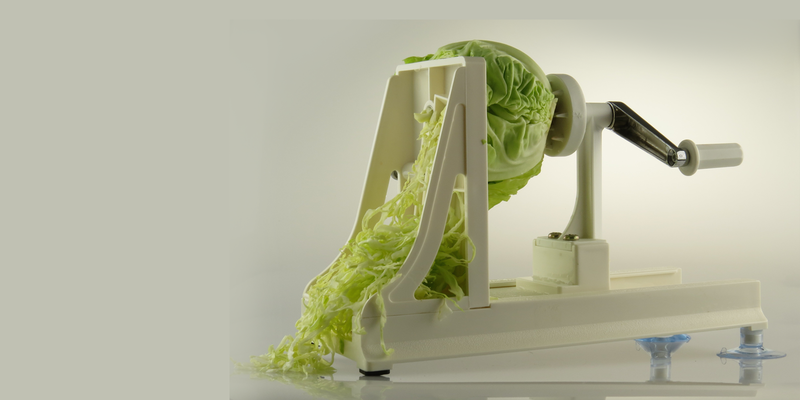 The flat blade can also be used to shred cabbage for coleslaw and perfectly slice onion rings. Cut both ends of the fruit/vegetable off. Push the fat end of the vegetable onto the pipe blade. Holding the vegetable push the spikes on the rotating disk onto the other end of the vegetable.